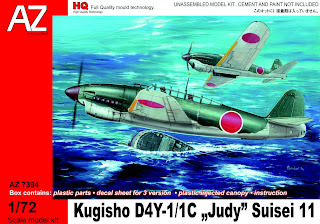 On the IJN theme and further to my blogging about Glen kits here and here, Andy Zoledowski from Canada has very kindly sent me images of his build of a 1/72nd resin "garage" kit and its instruction sheet which he bought on a trip to Japan. 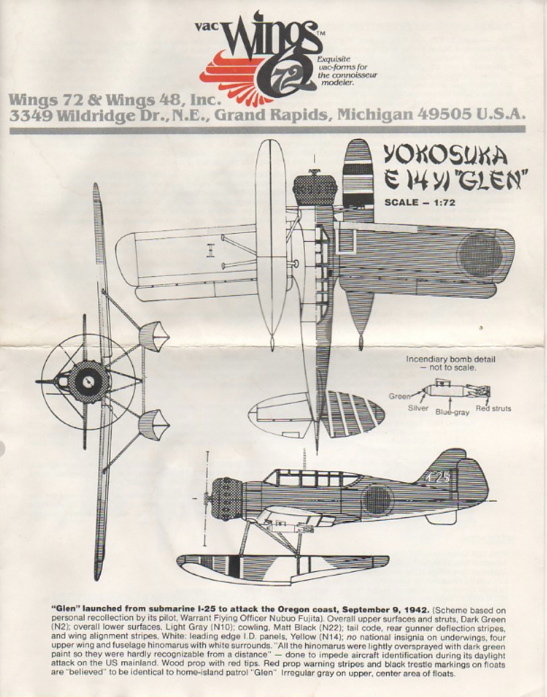 It was made by a company called Miyazawa and consisted of resin main parts with white metal struts and decals. Very interesting and completely new to me. I wonder if they made any other kits? Thanks to Andrew for sharing these images. 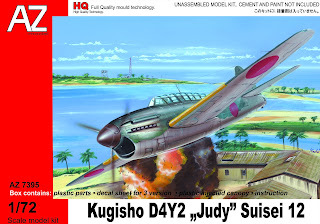 Shortly to come from the prolific AZ Models is a new series of Kugisho D4Y "Judy" kits in 1/72nd scale covering the inline-engined D4Y1, D4Y2 and D4Y2-S nightfighter and the radial engined D4Y3. Judy interior colours have been touched on here, and external colours here and here, but I'll blog in more detail about that once the kits are out and available. The Fujimi family of D4Y kits is still available intermittently from HLJ at what are now very low prices so again the choice of subject is a little puzzling but I'm hoping the interiors of the new kits will be better detailed and the selection of markings options is certainly good. 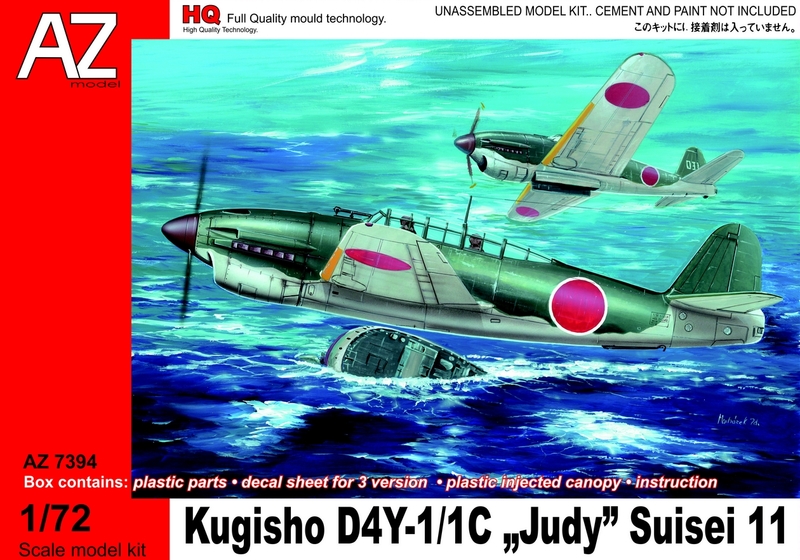 Rather unbelievably the old LS 1/75th scale D4Y2 kit is also still available from Arii if you fancy a bit of retro modelling to warm up while you wait for these! 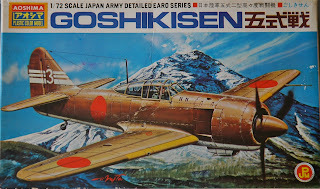 Image credits:- Miyazawa Glen model and kit details courtesy of Andrew Zoledowski; AZ Models box art images © 2012 AZ Models. Continuing the Kawasaki theme it is a delight to be able to share these images of a superb build of the Fine Molds Kawasaki Ki-100 Otsu "Bubbletop" kit in 1/72nd scale by Japanese modeller Tondeke. The canopy is a home made heat 'n' smash replacement and Tondeke used brass tube for the exhausts and guns. In addition he made his own instrument panel decal and added brake lines. The model represents an aircraft of the 244th Sentai. Paintwork representing the late-war # 7 olive brown colour is excellent and note the attention to detail and finesse of the paint chipping and exhaust staining. 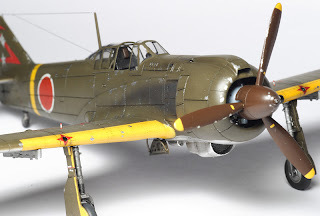 Tondeke has an impressive portfolio of 1/72nd as well as some unbelievably exquisite 1/144th scale models of other Japanese subjects to view at his own blog, as well as other types. 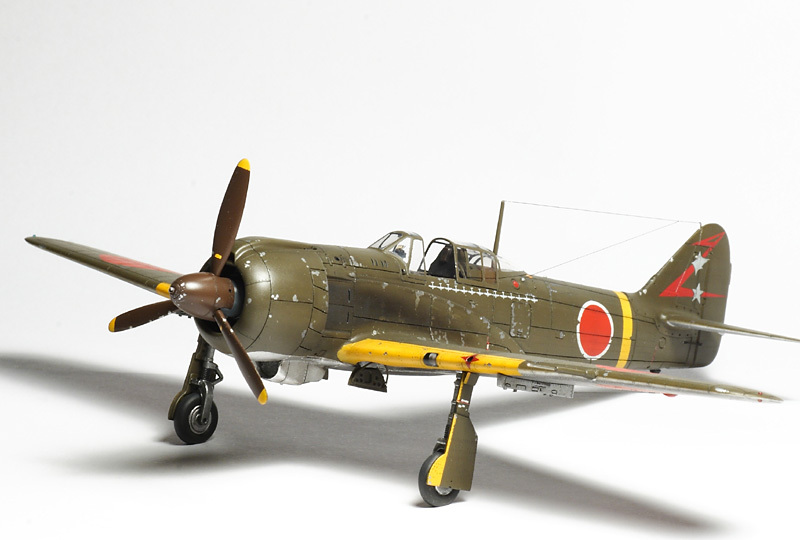 The 1/144th scale collection can easily be taken for 1/72nd scale models. 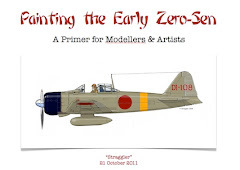 With thanks for his kind permission to show his excellent Ki-100 model here. 3. 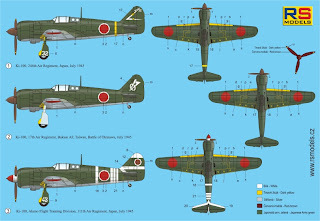 Ki-43-II of 2nd Chutai, 63rd Sentai with an unusual "crazy paving" pattern over a worn or previously mottled scheme. Likely colours are suggested but this one is up for grabs (see photo below). 4. 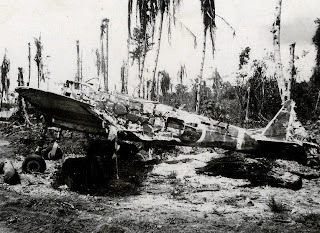 Ki-43-II of 13th Sentai at Kamiri, Noemfoor in early 1944. 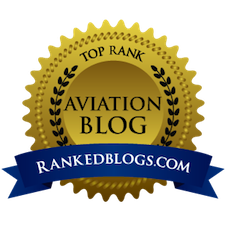 This tail marking was identified recently on j-aircraft.com with a photograph. 6. 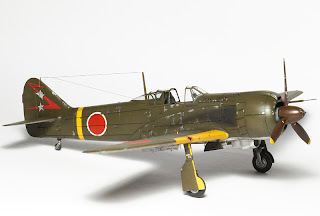 Ki-43-II of 2nd Chutai, 24th Sentai at Hollandia in 1944 in green mottle over natural metal finish (nmf). Sufficient Hinomaru are also included for two Hayabusa, two Hien and one Toryu. 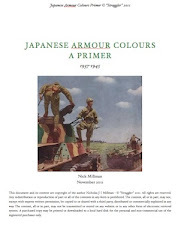 This is an excellent sheet offering interesting and much needed subjects which will provide for an enjoyable interpretation of the diverse schemes and colours shown. 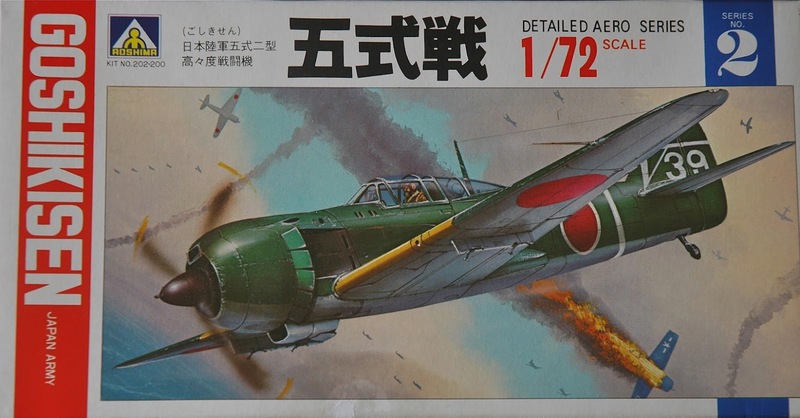 The most common colour schemes for Hayabusa operating in SWPA were either plain dark olive green - (緑色 midori iro) IJAAF paint standard colour # 21 - (approximately the "Nakajima Green" of hobby paints) or nmf with various green and/or brown mottles applied. Several units painted "kumogata" (雲形 - cloud shaped) segments of a yellowish or orange brown over the green to better suit the topography of the theatre, usually matching the "dry grass" ochre colour (枯れ草色 - karekusa iro) IJAAF paint standard colour # 30. 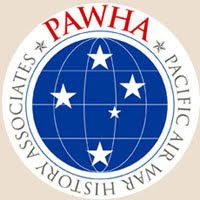 The 248th added this colour as large irregular patches on some aircraft, in one case with the whole tail area painted brown. 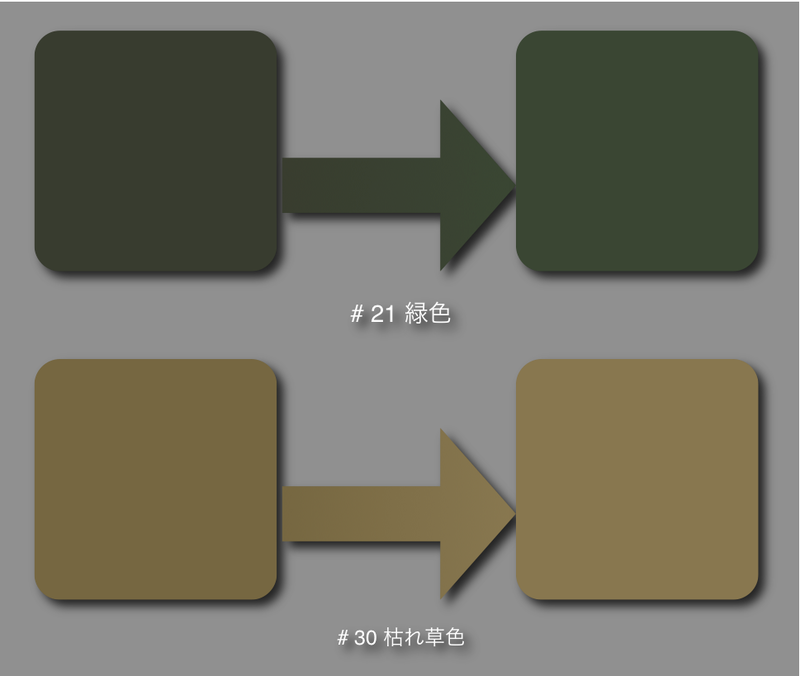 This colour could appear as a slightly more greenish looking ochre or towards a slightly more orange brown that was sometimes referred to colloquially as "kaki iro" (柿色 - the colour of a persimmon) and might indeed have represented IJAAF paint standard colour # 31 ( カーキ色 - khaki iro). 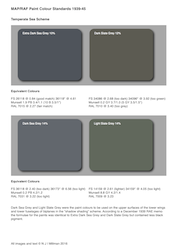 Typical ranges for these two colours are shown here but don't sweat it as both showed considerable variation as well as the different batches of paint fading and degrading to different appearances. 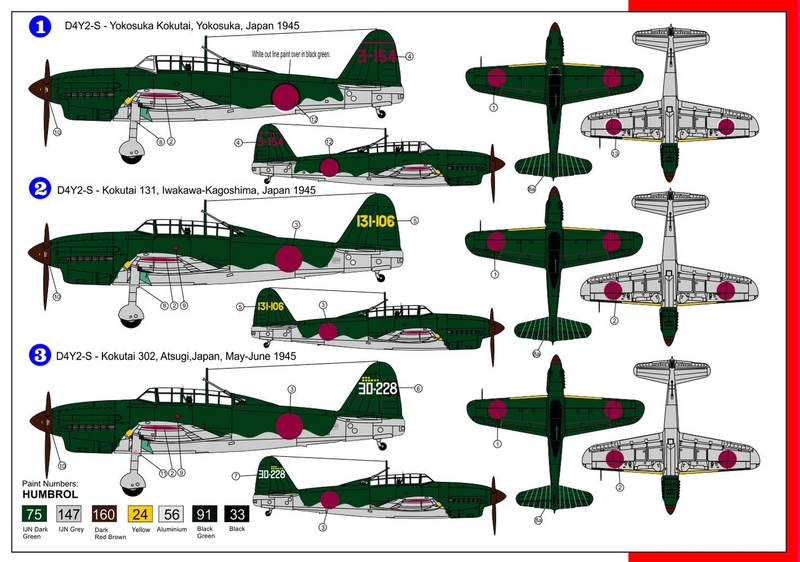 Although not included on this sheet the 1st Sentai in Indo-China used a low contrast camouflage scheme of dark olive green with tea colour "kumogata" - a darker, more reddish brown - prior to moving into the New Guinea theatre. I don't know whether the yellowish-brown ochre camouflage was subsequently applied to some aircraft with this scheme but it would make for an interesting three-colour possibility. 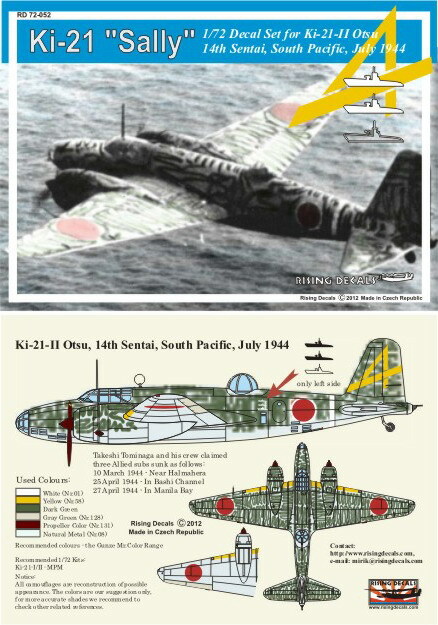 "Fantastic colour schemes and markings were noticed - two were actually seen with plain yellow roundels on wings and fuselage. No sign of red paint could be detected beneath the yellow. Sixty per cent of those lying about were coloured silver and green. 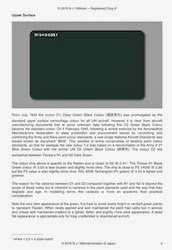 Twenty per cent light green on upper surfaces with light grey undersides, and the remaining 20 per cent in many different shades, tones and mixtures of light green and brown." 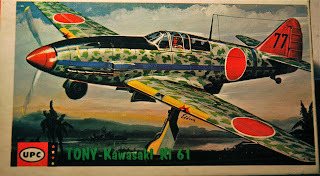 "In common with most Japanese aeroplanes seen, the three Oscar 2s had a yellowish green finish all over the interior." 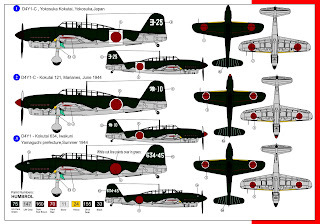 A small sheet 72-052 for a single 14th Sentai Ki-21-II has also been released by Rising Decals. This aircraft was flown by Takeshi Tominaga and featured three victory symbols for submarines claimed as destroyed. Colour scheme is dark green snake or palm frond weave over natural metal. 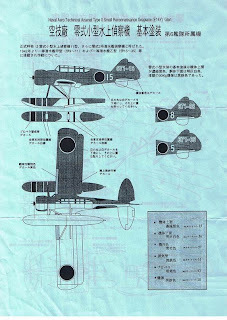 The sheet consists only of the tail marking, victory symbols and white senchi hiyoshiki fuselage stripe without any Hinomaru. 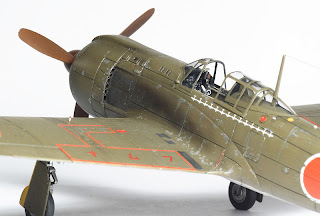 It is recommended for the MPM kit which is not that easy to find and a reminder that there is still no mainstream, 1/72nd scale injection molded Ki-21 readily available. 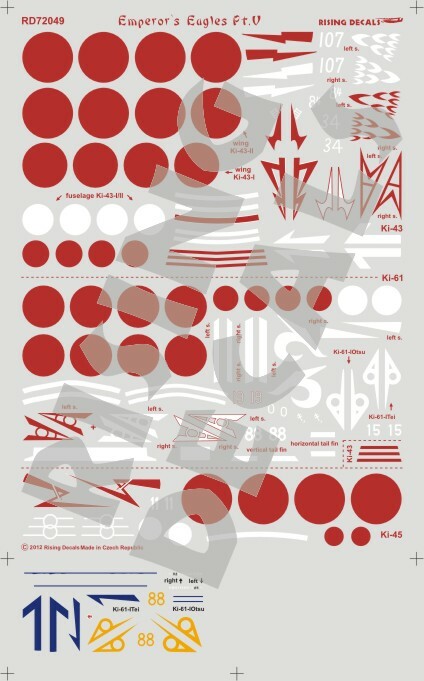 A remarkable situation when kits of very obscure types are available. 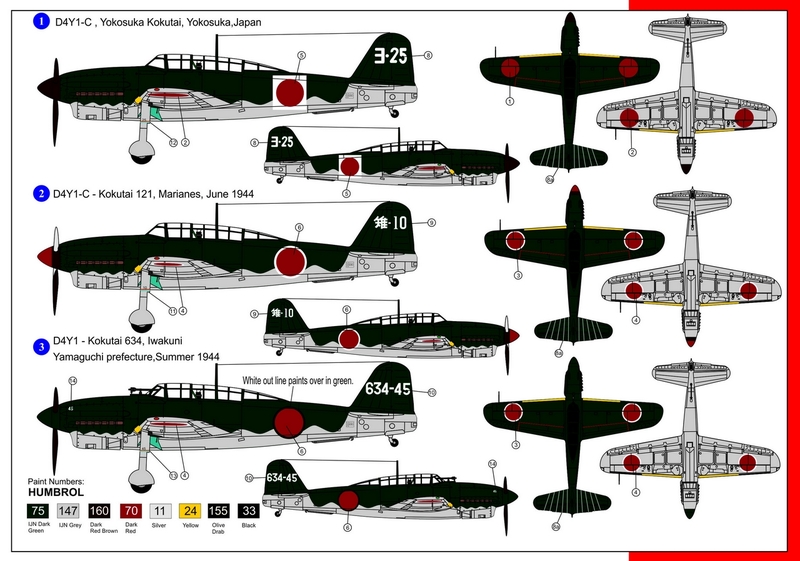 With thanks to Mirek of Rising Decals for providing review samples of these sheets. Back in April I mentioned the relative decency of the old 1/70th scale Nichimo Kawasaki Ki-61-II in a blog about the new RS Models Ki-61-II kits and subsequently posted pics of the Nichimo model as built by Ken Glass. To complete the picture the horrible Fujimi Ki-61-II Kai was mentioned but not all the issue version box art of that kit was shown. The earliest 1965 'One Hundred Series' No. 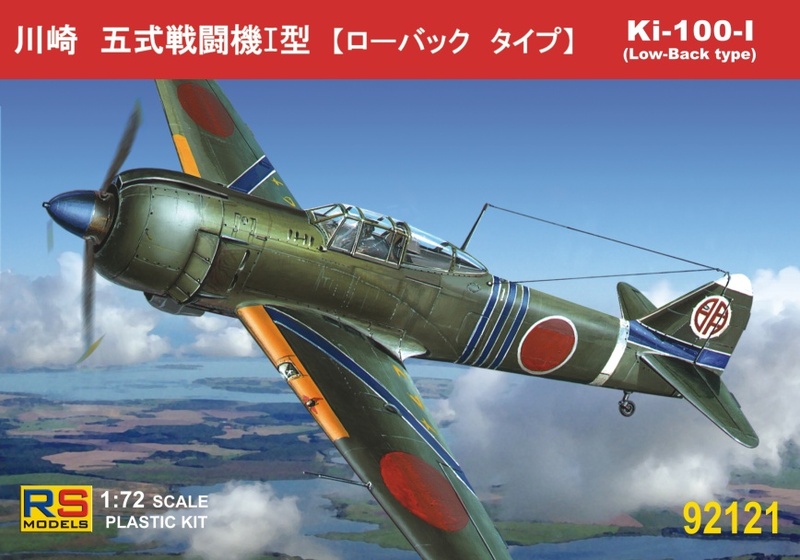 6 box art for the Ki-61 飛燕 (Hien - swallow in flight) as shown above managed to look even worse than the kit itself whereas the subsequently issued # 7A6-100 (shown in the previous blog) rather nicely depicted a 244th Sentai Ki-61-I! 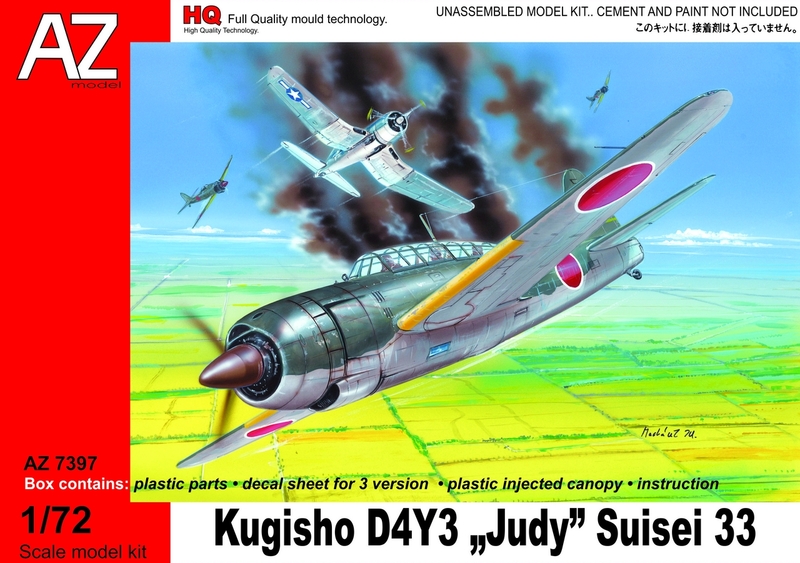 In 1966 the kit was released as 8016-49 by UPC with Scott Eidson (b.1908) box art as shown above. Eidson's distinctive art usually featured dawn or dusk take-off or landing scenes (hard to tell which) with moody looking skies and often shadowy buildings with twinkling lights and the suggestion of recent rain. The Tony box art has a shadowy warship in the background. In the mid-1960s UPC - Universal Powermaster Corporation - marketed re-boxed kits from many sources including the emergent Japanese companies. 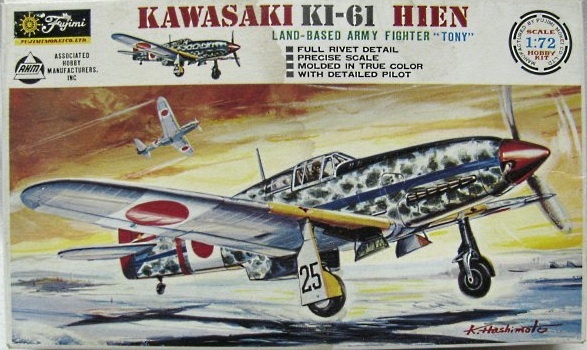 The UPC kit - just labelled "Tony - Kawasaki Ki 61" - is identical to the original Fujimi kit down to the silver plastic but contains a new instruction sheet. Burns lists the kit as to 1/70th scale. 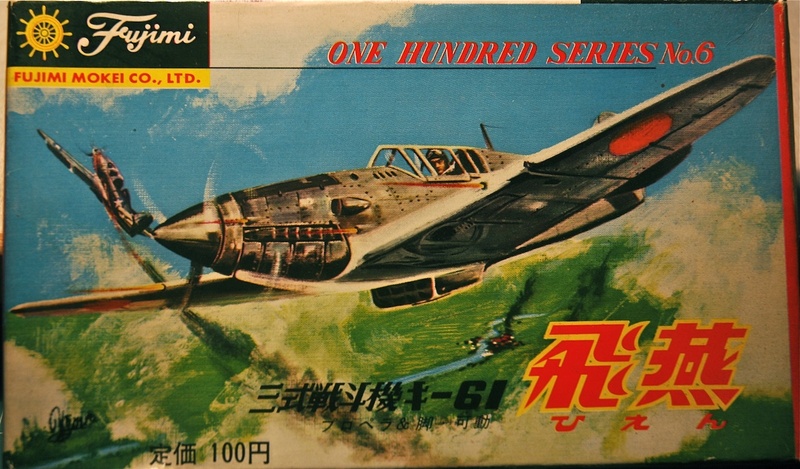 As previously noted, the same kit was subsequently re-issued by Bachmann Bros, Inc., from 1972-73 as 076-60 with K Hashimoto artwork depicting a 244th Sentai II-Kai taking off. This artwork had appeared in monochrome on the 'One Hundred Series' instruction sheet and presumably a missing link here is the Japanese issue with the same boxart? 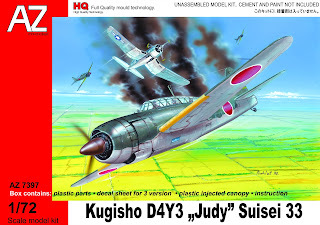 The Bachmann released kits are generally known as Bachmann-Fujimi as the two logos appear together on the box. 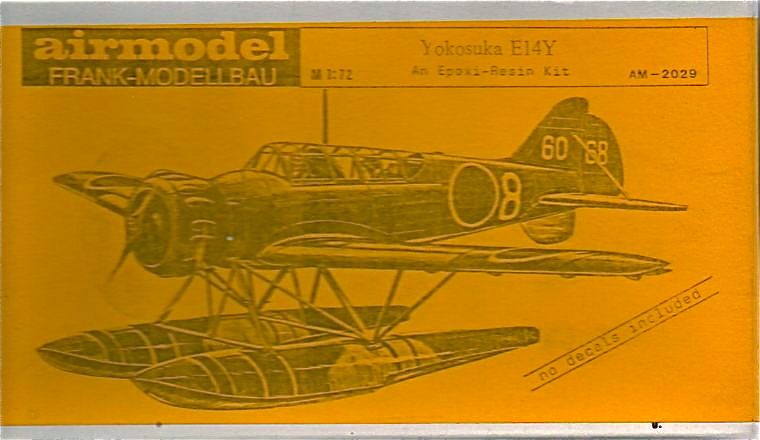 The Fujimi kit had been previously issued in the West in the late 1960s by AHM as FC-6 - with an identical box and box art as shown below. AHM - Associated Hobby Manufacturers - had imported and re-sold the Fujimi kits until 1971 when Bachmann took over the relationship with the Japanese company until 1975. Further to my blog in September about the new Glen book by Ryusuke Ishiguro and Tadeusz Januszewski which included mention of Glen kits, Jacob Terlouw has very kindly sent me these images of the 'airmodel' Frank-Modellbau epoxy resin kit of unknown vintage and the plans sheet from the Wings 72 vacform. Thanks to Jacob for thoughtfully providing these additional images to share. As always, any more information on these or similar kits, personal memories of them and any box art images are always welcome here, thanks. 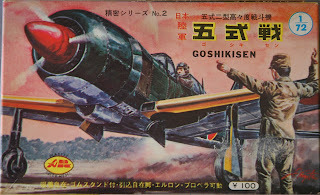 Image credits:- Fujimi Ki-61 box art © 1965 Fujimi Mokei Co., Ltd; UPC 1966 box art from author's collection; AHM box art via Old Model Kits; airmodel & Wings 72 Glen images © 2012 J Terlouw. 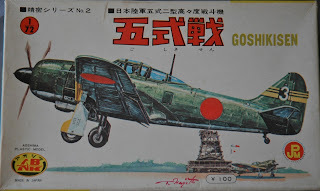 When I briefly ran through the Aoshima range of kits here and here I deliberately omitted any examination of their only Army subject - the Kawasaki Ki-100 Goshikisen - as I planned to cover it with a dedicated blog. 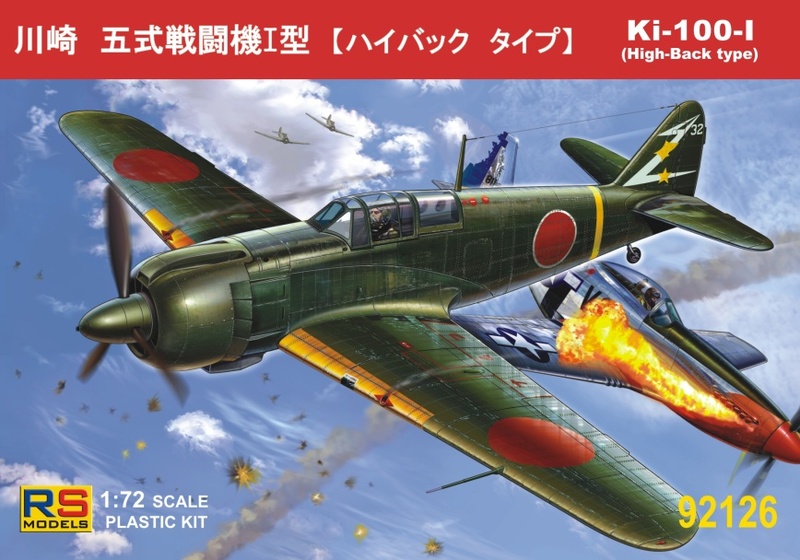 The recent blogs on Ki-61-II Kai and Ki-100 models provided the catalyst to finally get the box art images done. 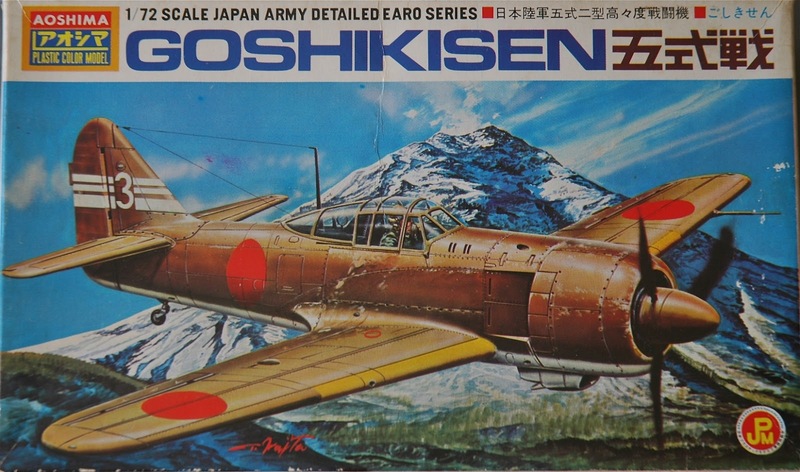 This kit was released originally as No.2 (following the A7M2 Reppu "Sam") under the Aosima label (same company) in 1964, simply as Rikugun Goshikisen (陸軍 五式戦 - Army Five Type Fighter) in a Japanese language box with no English. The box art depicted the tail marking of the 3rd prototype Ki-100-II (with the turbo-supercharger) but the artist seemed to think the port wing root intake was a landing light! The kit itself was very simple, with only 21 parts and a very basic decal sheet providing six hinomaru only. 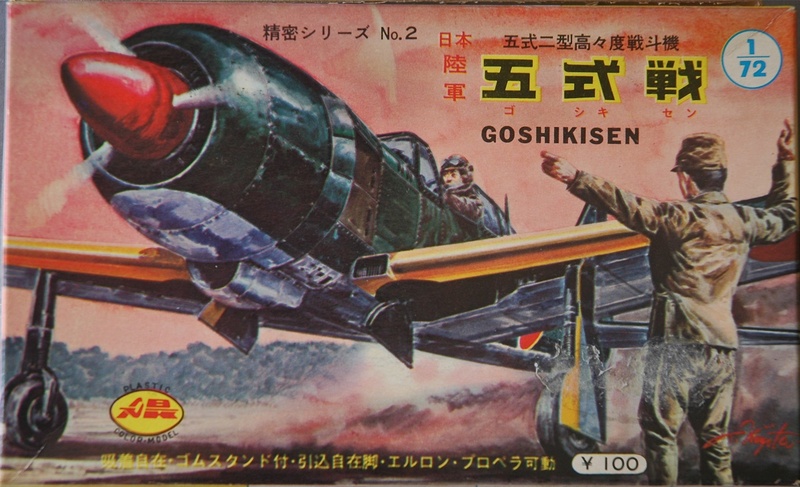 Re-issued over the years with various new box arts, Aoshima's Goshikisen is, rather incredibly, still available from the same company today, 48 years later. 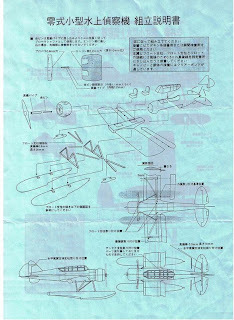 Aoshima was founded in Shizuoka city in 1924 as the Aeroplane Research Institute and began making model aeroplanes for schools in 1929. 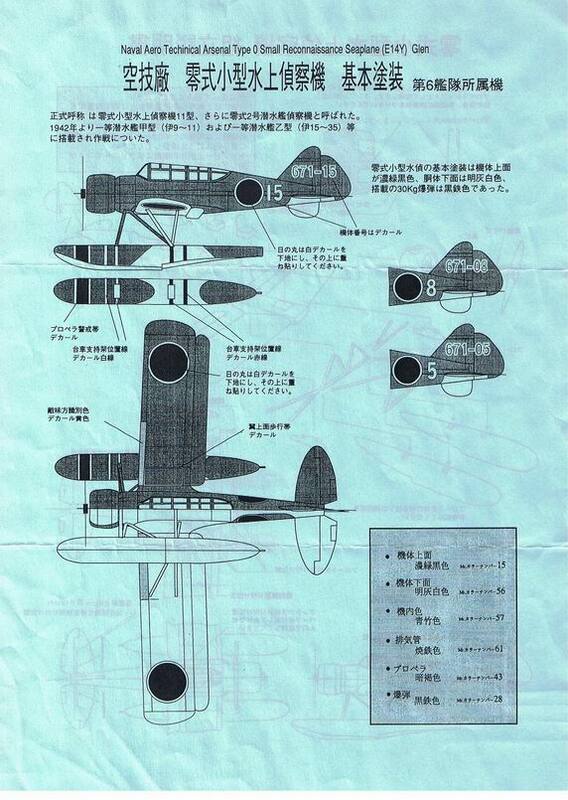 The founder of the company Jiro Aoshima was the chairman of the Shizuoka Model Aeroplane Association. 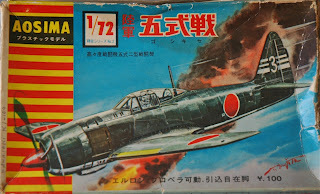 In 1945 the company was established as Aoshima Bunka Kyozai RL making wooden model aeroplanes. 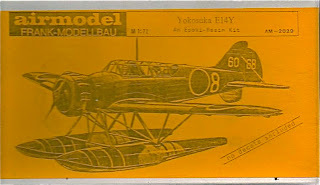 In 1961 with Ichiro Aoshima as CEO the company began making its first plastic construction kits. 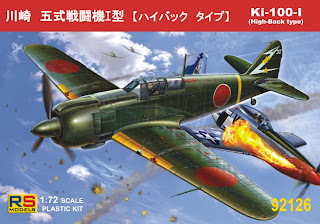 The range of aircraft kits has always been relatively small and nowadays the company is perhaps better known for its range of model cars and 1/700th scale waterline warships. 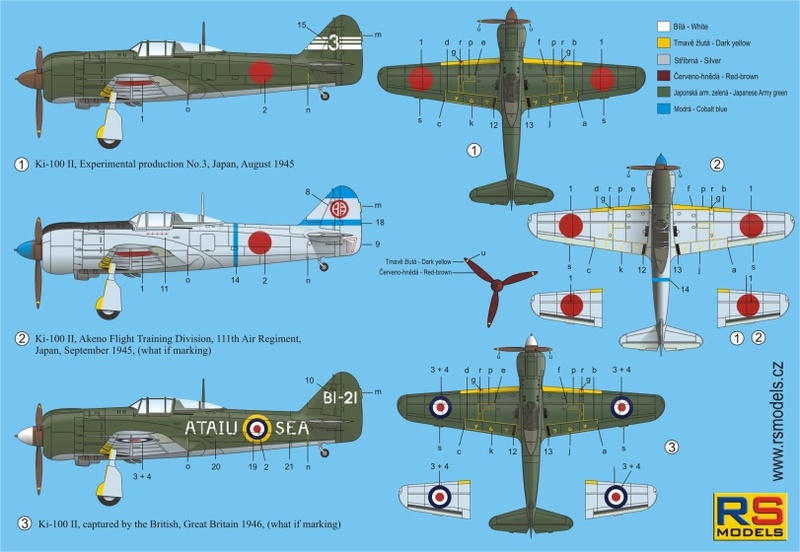 Although the Aoshima Goshikisen has the wing root intake and the plain cowling with no carburettor air intake it lacks the turbo-supercharger and the oil cooler is replicated in the central position of the Ki-100-I rather than offset to starboard as in the Ki-100-II. The Aoshima Ki-100 is continuously confused by modellers online for the Fujimi (and Fujimi-Bachmann) Ki-100 (to be examined later) but the kits are actually very different in both engineering and their completed appearance. 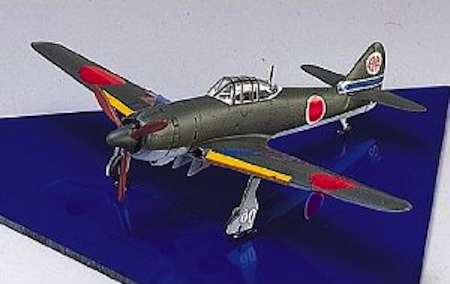 The Aoshima kit has a single-piece canopy which is overscale and too deep, sitting on top of the fuselage rather than following the cowling panel line. 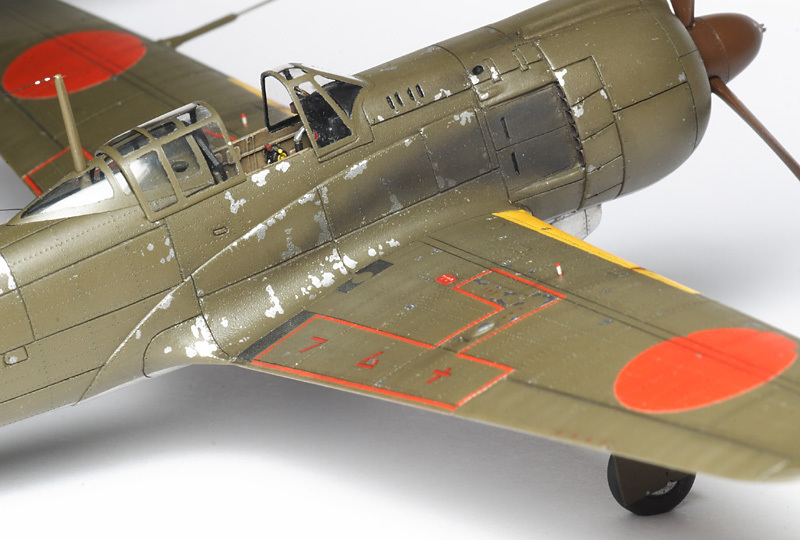 Leaving aside the typically clunky Aoshima moulding and vintage features such as the "peg and pilot" cockpit interior and gaping wheel wells, this is probably the most detracting feature of the kit which otherwise shapes up pretty well - considering its age. Another issue with the kit's appearance is that although the cooling slots are represented the rectangular fairings behind the exhaust outlets conform to the outer fuselage contours rather than being correctly recessed. 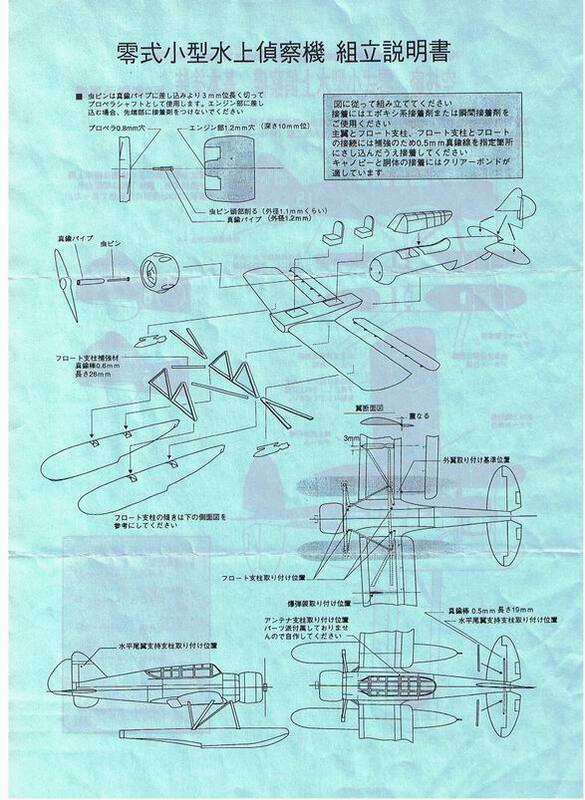 Unlike many kits of that era, however, an attempt was made to give the cowling the correct, slightly bulbous shape in plan view rather than the usual tapering effect. 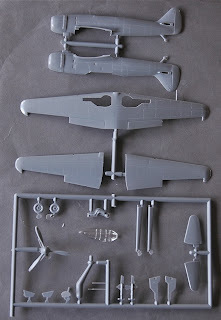 The ailerons are separate parts, intended to be movable and the undercarriage is also designed to retract - although there is no provision for the small inner doors to close. The kit includes a stand support but no base, this being originally intended to fit into a rubber suction cup which might have been available separately. At least I have never seen one included in a kit box. 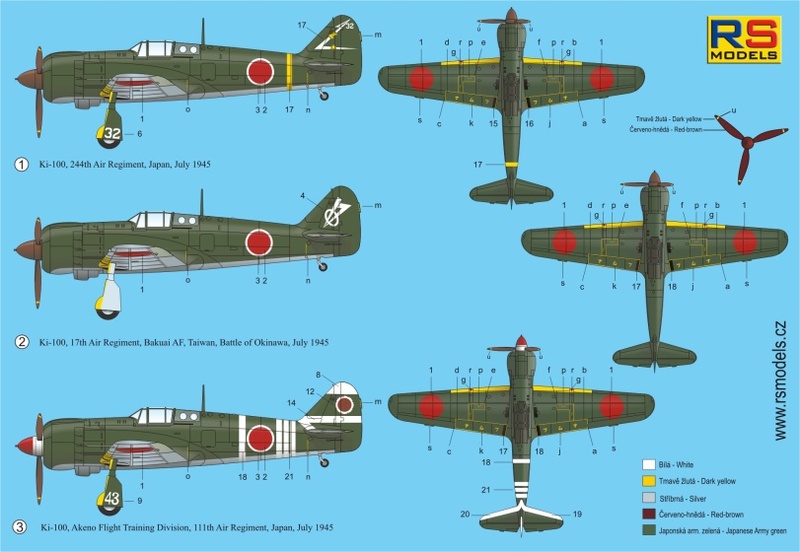 The latest issue of the kit in the "WWII Wings" series identifies the aircraft as a Ki-100-II for the first time and includes an extended decal sheet with markings for the 3rd prototype, ace Maj Yohei Hinoki's Akeno 111th Air Regiment, and a somewhat eclectic selection of insignia including Manchukuo roundels! Considering its age the kit is still quite cleanly moulded. Is it worth building today? That probably depends on your attitude to modelling and the extent of your nostalgia - and quite possibly your sense of humour too. 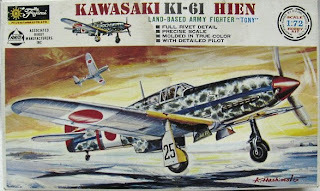 There is no doubt that improving the appearance of this kit is a labour of love, a lot of fun and possibly quite barmy! 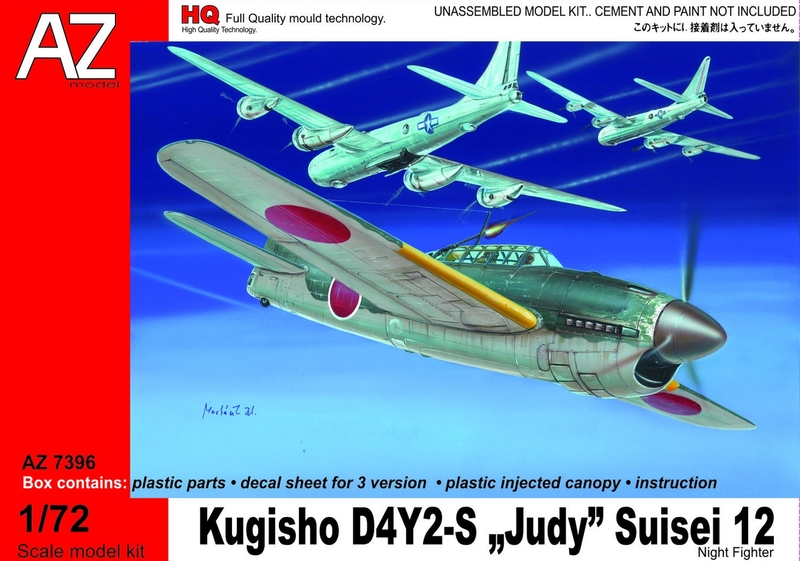 Basic Kit Parts - not to be confused with Fujimi! 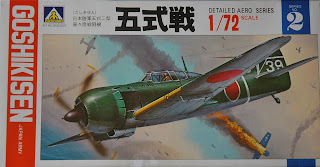 Image credits: All © 2012 Aoshima Bunka Kyozai Co., Ltd.
To the best of my knowledge there has only been one mainstream injection model of the Ki-100-II in 1/72nd scale, together with a Ki-100 Otsu kit that offered the parts for one in a somewhat covert manner. Of those two veterans, which often get mightily confused on forums, more anon. But for now RS Models new Ki-100-II has arrived here in the mountains at Schloss Nachzügler and I'm waiting for the Ki-100 Ko and Otsu from the same manufacturer. I've always been interested in Japanese experimentals and have a long running line-up of Kawasaki's design and development achievements including foreign influences (so long running that I've started re-building the earlier efforts to improve on their quality and my Merlin Ki-32 which was started several decades ago is still not finished). This otherwise injection moulded kit contains resin in the form of a two part engine (the prop reduction gearbox is a separate plastic part) and the turbo-supercharger assembly (the frames pic above is from the RS Models site). 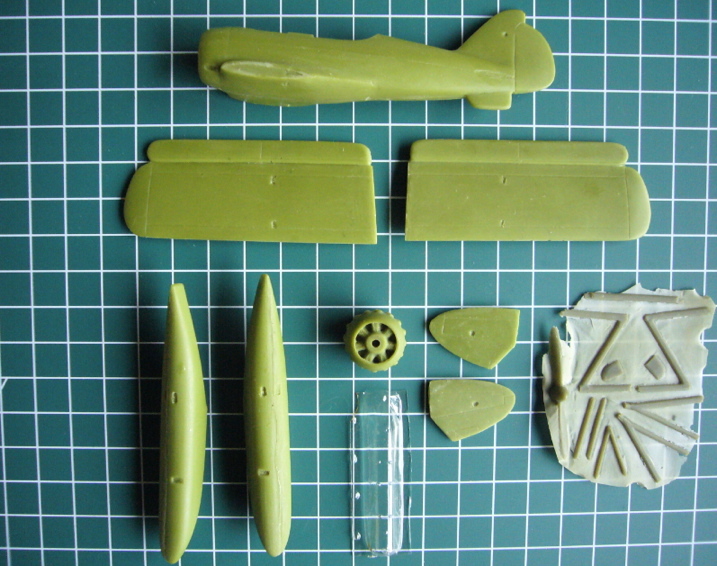 But the kit I bought also contains a pair of resin exhaust outlets and for some odd reason the flat panels to their rear even though those are already moulded as part of the fuselage halves and seem perfectly adequate as they are. The instructions do not show these - or the resin exhaust outlets! The wing root turbo-supercharger air intake is also a resin part that looks like it might be fiddly to instal. I tend to have alarums and excursions on seeing resin parts, not being a fan of superglue, and I'm sure this Pavlovian reaction impedes objective judgement when it comes to assessing a kit. The cowl ring appears to be standard to all the kits and requires a recess for the redundant carburettor intake on the top to be filled. 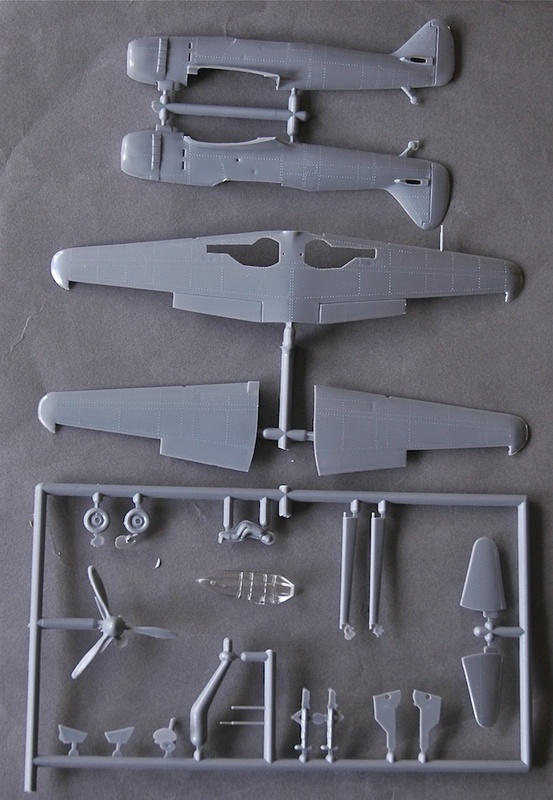 Extra plastic parts are a new forward fuselage top insert (without the carburettor intake) and a new lower fuselage centre section with recesses for the turbo-supercharger assembly and offset oil cooler. 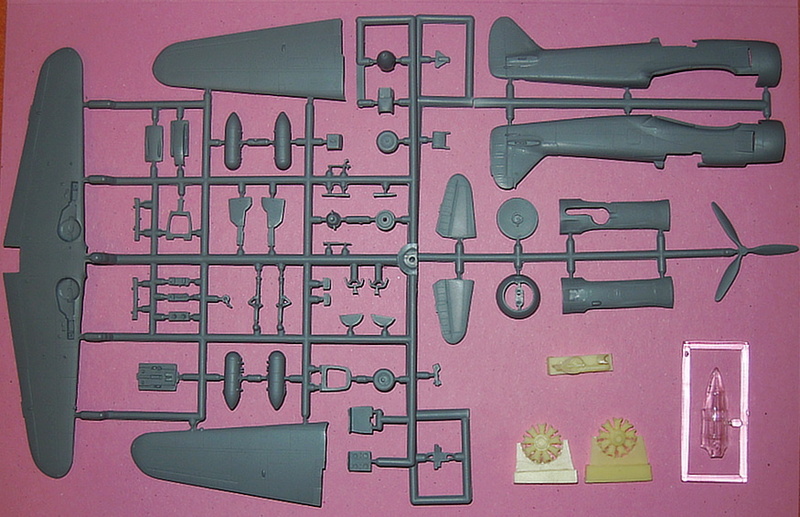 The all plastic cockpit interior reassures me, consisting of moulded-in sidewall detail, detailed floor, forward and rear bulkheads, two-part seat, stick, engraved instrument panel, separate gun breeches and a gunsight. The one-piece canopy is injection moulded, albeit with a rather shallow looking windscreen. 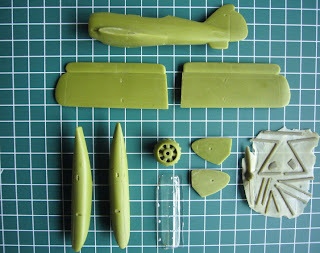 Comparing this canopy to the Fine Molds kit canopy and to photographs and plans it is clear that the windscreen is too small and the rake back angle too shallow. Fortunately the Falcon IJA vacform canopy set contains two excellent Ki-100 bubbletop canopies that could probably be adapted to fit. 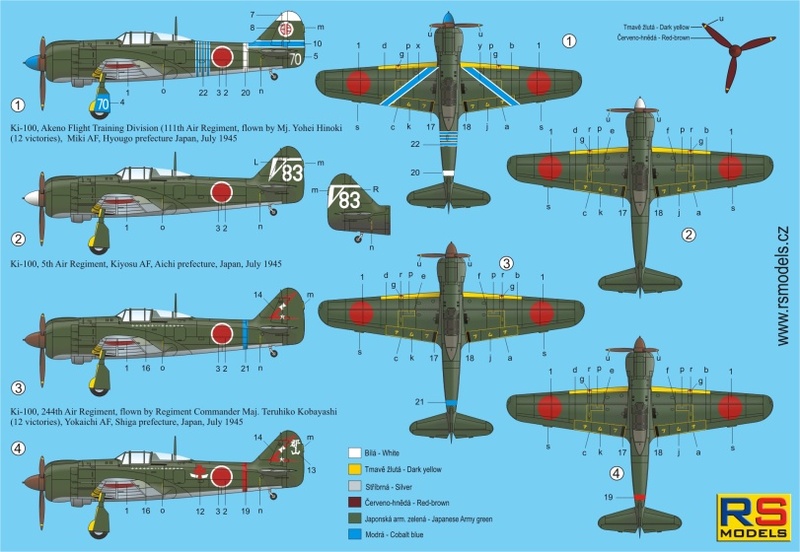 Part # 8, the razorback fairing under the rear canopy with the twin lightening holes, included but not required, will prove useful if you plan to improve the Nichimo Ki-61-II Kai! 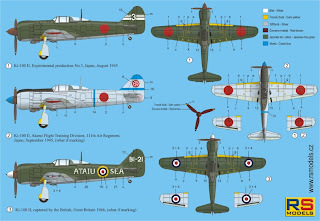 There are three markings options on the well-printed decal sheet included in the kit, the first being for the actual 3rd prototype, then an imaginary Akeno 111th Sentai Homeland Defence fighter in unlikely natural metal finish and finally a captured ATAIU-SEA example with the equally unlikely IJN tail code 'B1-21'. This code was applied to a Zero of Air Group 381 in the Singapore/Malaya area so it stretches the imagination even for a 'what-if'. The undercarriage parts are neatly moulded with nice inner detail on the main wheel covers and separate retraction yokes for the small inner doors. The prop is a three-part assembly and has a backing plate for the spinner. And finally there are a pair of underwing racks and droptanks. The Ki-100-II was a remarkable aircraft and deserves inclusion in any IJAAF collection, being the lightest turbo-supercharged fighter of WWII and testimony to the design and adaptability skills of the Japanese aircraft industry. 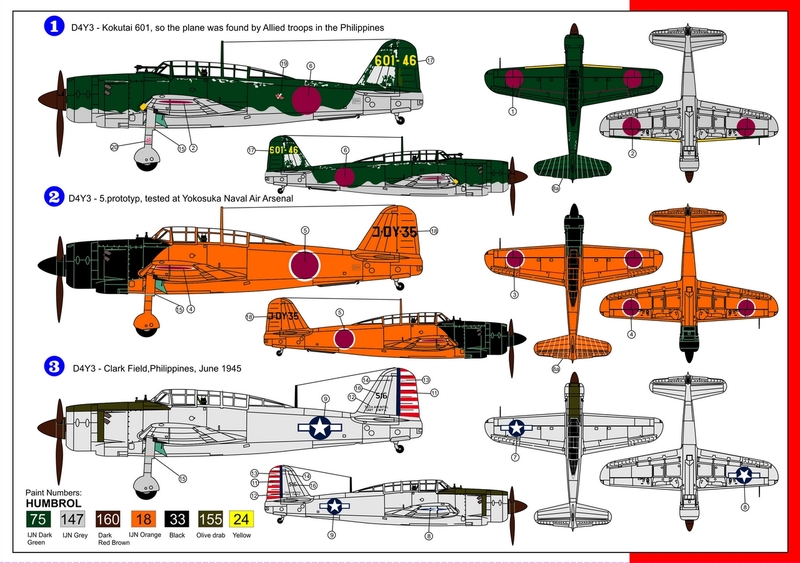 The efficient turbo-supercharger installation drew on experience from Kawasaki's Ki-108 and Ki-102 Ko projects and the overall design achievement makes an interesting comparison - and contrast - to the heavy Nakajima Ki-87 and Tachikawa Ki-94 projects. 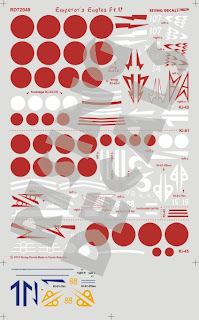 For "what-if" fans it offers potential in terms of speculative markings far beyond those offered in the kit. In total three prototype Ki-100-II were built with the third being photographed in a damaged state at Kagamigahara after the war. Sadly it was not preserved. 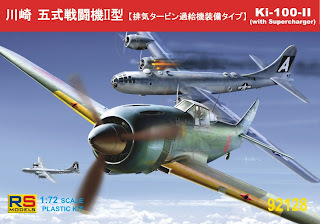 The Fine Molds Ki-100 duo from 2001 (was it really that long ago?) 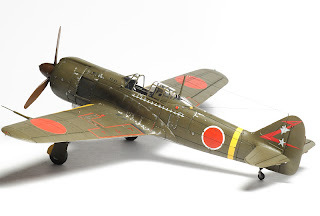 did not include the Ki-100-II so the RS Models release is welcome, but the standard Ki-100-I razorback (markings options for 244th, 17th and 111th Sentai) and bubbletop (markings options for 111th, 5th and 2 x 244th Sentai) shown here are puzzling additions. They retail for approximately £15 each whereas the Fine Molds examples may still be had for under £12 each direct from Japan. Perhaps the marketing is based on availability in Eastern Europe or the high price of the Fine Molds kits from Western retailers (often in the £18-£21 bracket)? More on these when they arrive and some discussion of Ki-100 colours. RS Models Ki-100-1 razorback and bubbletop models now received. 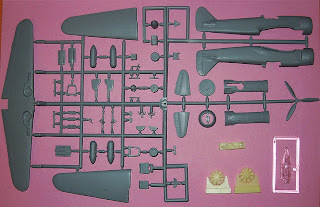 As expected the only resin parts in these kits are the two row radial engines. 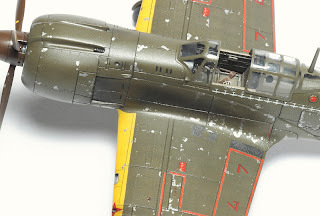 The razorback canopy appears to have the same windscreen issue as the bubbletop. 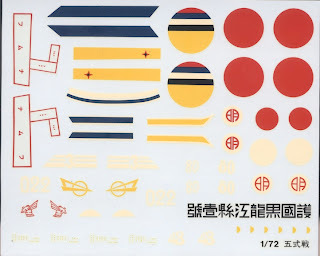 Decals look very good, especially the 111th Sentai examples. I have added the markings options above. 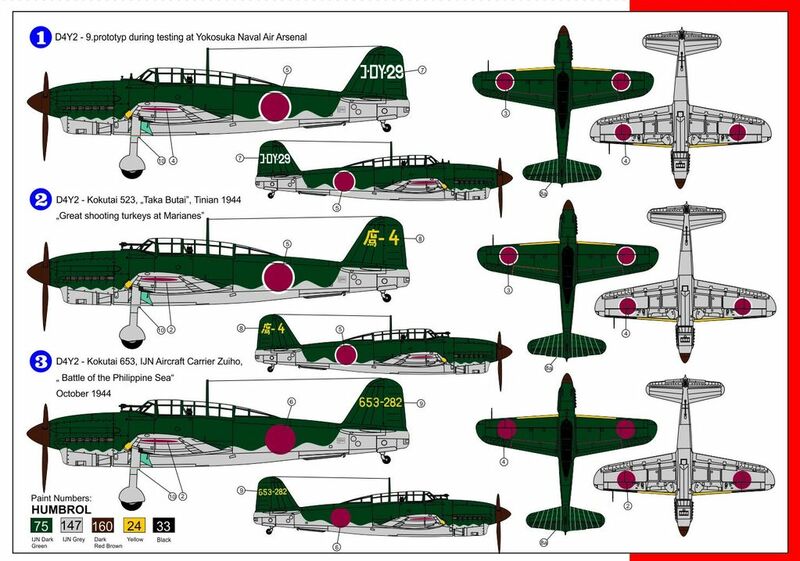 Bubbletop has markings for aces Maj Yohei Hinoki and Teruhiko Kobayashi together with a mysterious, unidentified fourth 244th Sentai option with "shamrock" artwork.